The first attempt to build a Danish cohousing community began in the winter of 1964 when Danish architect Jan Gudmand-Hoyer gathered a group of friends to discuss current housing options. Over several months, this circle of friends discussed possibilities for a more supportive living environment. By the end of the year, they had bought a site on the outskirts of Copenhagen and developed plans for twelve terraced houses set around a common house and swimming pool. Although the city officials supported the plan, the neighbors did not and the group eventually sold the site without building anything. Gudmand-Hoyer went on to write an article entitled “The Missing Link between Utopia and the Dated One-Family House,” in which he described his group’s ideas and their project. When published in a national newspaper in 1968, the article elicited responses from over a hundred families interested in living in a similar community. The groups joined forces in 1968 and found a couple of sites, one in Jonstrup, a small village outside Copenhagen, and another near Hillerod. By the end of 1973, both communities, Saettedammen and Skraplanet, had completed construction. A third community, Nonbo Hede, was completed in 1976 near Viborg. These early cohousing communities were practical first steps toward the ideals put forth by Gudmand-Hoyer and Bodil Graae, but were never considered the embodiment of all that cohousing should be. Although the initiators had sought a diverse mixture of resident ages and incomes, social and financial realities called for compromise if the projects were to be built at all. As early as 1968, Gudmand-Hoyer was working with a group to develop a more collective and integrated cohousing project. Known as the Farum Project, the design called for dwellings for families and singles clustered around an interior common area including a school, all connected by a glass covered pedestrian street. At a housing exhibition in 1970, this proposal attracted the interest of several non-profit housing developers. Meanwhile in 1971, the Danish Building Research Institute sponsored a national design competition for low-rise, clustered housing. All of the winning proposals emphasized common facilities and resident participation in the design process. The competition was well publicized and had a tremendous impact on the Danish housing debate. Five years later, Tinggarden, the first rental cohousing community, was completed, designed by the winning architectural firm Vandkunsten, sponsored by the Institute, and built by a non-profit housing developer. By 1982, twenty-two owner-occupied cohousing communities had been built in Denmark. Each completed cohousing community had faced tremendous difficulties, particularly in the financial realm. In 1978, to assist resident groups through the planning stages, Gudmand-Hoyer and a group of other professionals formed a support association called SAMBO (roughly translated as “live together”). Additional support followed with the 1981 passage of the Cooperative Housing Association Law, national legislation that made it easier and less expensive to finance cohousing. 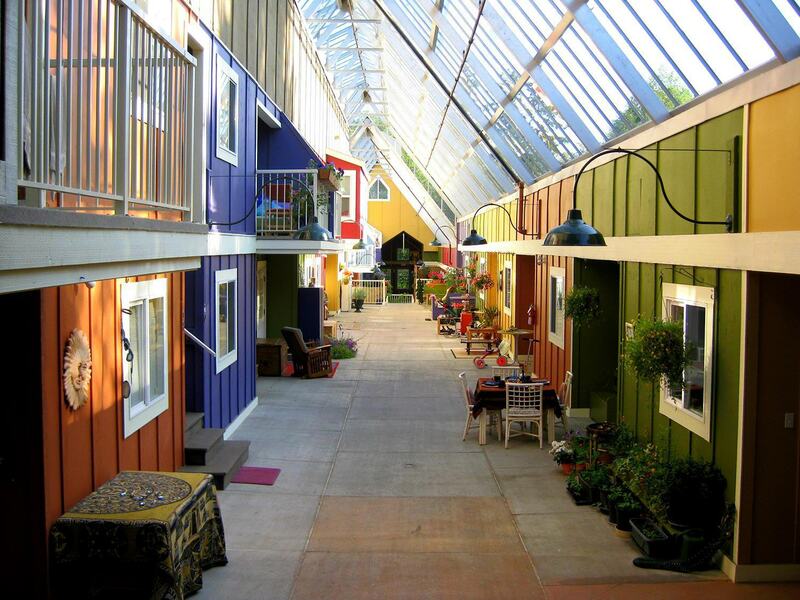 Since then, most Danish cohousing communities have been structured as limited equity cooperatives financed with government-sponsored loans, including ten rental cohousing communities. After initial skepticism, cohousing has won the support of the Danish government and financial institutions. Banks are particularly attracted because most cohousing units are pre-sold long before construction is completed, a record with which few other housing developments can compete. The ideas from cohousing have filtered into Danish society; speculative cohousing developers have integrated cohousing design concepts and older neighborhoods have organized dinner clubs. Cohousing is now a well-established housing option in Denmark. Not only do new communities continue to be built, but the concept has been incorporated into master plans for large areas of new development. Since Gudmand-Hoyer began discussing his ideas for a cooperative living environment nearly three decades ago, the cohousing concept has evolved. The average size of individual residences in new communities is almost half of what it was at the original projects. While individual residences have decreased in size, shared facilities have increased in relative proportion and importance. Cohousing residents have chosen to cluster their dwellings closer together, especially evident in the new communities that connect ground level dwellings and common facilities under one roof. The range of unit mixes and the mixture of residents and household types has greatly diversified. Previous criticisms of cohousing as a high-priced option out of reach of common people no longer hold true in Denmark. The increasing willingness of residents to live close together reflects growing confidence in the cohousing concept, as people recognize its benefits and learn from existing communities.